NHL commissioner Gary Bettman, during a Seattle visit last week, seemed cool to the idea of this city hosting an outdoor game. Bettman suggested the city's rain would be problematic and that going under a roof at T-Mobile Park would detract from the outdoor experience. Oh well, as Meat Loaf might have sung back in the day — two out of three ain’t bad for this city when it comes to major NHL events. Then again, Meat Loaf was more into baseball metaphors for his songs than hockey. So, perhaps a couple of indoor NHL events coming this way won’t totally make up for an apparent Seattle rain snub when it comes to the league’s most prestigious outdoor showcase. On a swing through town last week, NHL commissioner Gary Bettman promised our city will play host to an All-Star Game within seven years of a team launching. Bettman also proclaimed we’ll likely get some type of draft held here before that. But other than the dubious face he made when somebody suggested “Metropolitans” and “Kraken” as the new team’s name, the one idea Bettman seemed downright allergic to was Seattle staging what actually has become the league’s biggest one-off attraction: the annual Winter Classic. That’s where you take two NHL teams, dress them up in retro uniforms and have them play an outdoor game in a football or baseball stadium. Sounds a little hokey, but it has become a hugely popular, driving force behind a nostalgia-based NHL marketing effort dating back more than a decade. 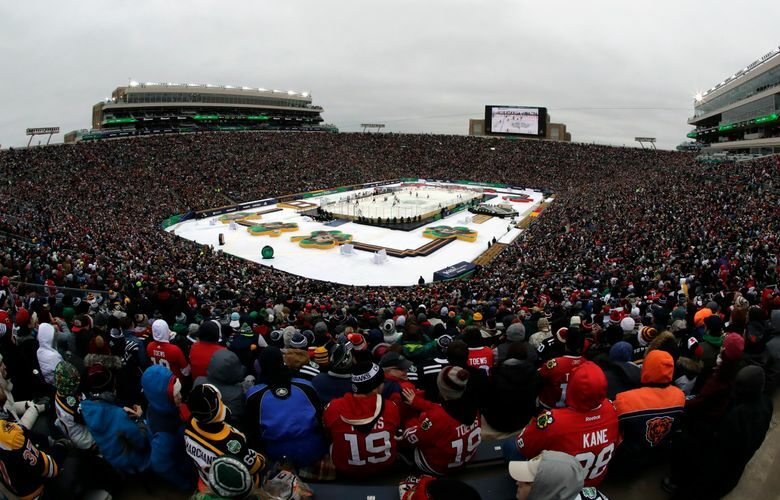 The outdoor games aren’t all called Winter Classic, though it has become the colloquial term of choice for NHL contests not taking place in an actual hockey arena. For official purposes, the Winter Classic occurs around New Year’s Day in a general region that already has an NHL team. This year’s was at Notre Dame Stadium in Indiana, where the “hometown” Chicago Blackhawks played the Boston Bruins. Then, you also have the NHL Heritage Classic, held infrequently and only among Canadian teams. Also, there’s the NHL Stadium Series from late January through early March in a U.S. football or baseball stadium. A little confusing, maybe, but don’t worry: We aren’t getting any of them. At least, that’s what Bettman seemed to suggest when asked. This isn’t the first time our city risks being passed over because of its wetter elements. We were supposed to get a Super Bowl played at CenturyLink Field at some point, but that has never materialized. Five years ago, while in New York City before the Seahawks beating the Denver Broncos in Super Bowl XLVIII in suburban New Jersey, I heard commissioner Roger Goodell say the league would consider future games in cold-weather cities. “I was up in Seattle for the NFC Championship Game, and if you want to feel energy, you go up to Seattle,” Goodell told the nation’s media at his pregame address. Some optimistic types back then pushing for a Super Bowl here by 2020 (it’s now booked solid through 2023) were even quoting weather averages, showing Seattle can be warmer than the New York area in early February. Alas, when I put the question to former Chicago Bears coach Mike Ditka, then an NFL Network analyst, he looked at me quizzically. Ditka was partially kidding. But he nailed it when it comes to our city’s biggest weather drawback, especially for a hockey game outdoors. It doesn’t matter that Boston might get more annual rainfall than we do. In hockey, even the slow drizzle or misty mornings that permeate our outdoors in non-summer months can wreak serious havoc on ice surfaces and pose a safety hazard to players. So, that rules out CenturyLink Field or Husky Stadium for a hockey game. Sure, there’s previously been talk of staging an outdoor junior-hockey game at T-Mobile Park, but Bettman does have a point about a roof taking away some of the mystique. These games, after all, are all about the nostalgia of outdoor hockey played a century ago on frozen Canadian ponds. The early “shinny” games in Ontario, Quebec and on the Prairies featured some snow and plenty of bone-chilling cold that players managed to suffer through and that the NHL apparently has no qualms about making its fans endure, either. The first NHL outdoor contest was the 2003 Heritage Classic at Commonwealth Stadium in Edmonton, where the Oilers and Montreal Canadiens played in minus-2 degree weather in front of 57,237 fans. A snowstorm greeted the 2008 Winter Classic in Buffalo between the Sabres and the Pittsburgh Penguins in front of 71,217 fans at Ralph Wilson Stadium, in the first U.S. outdoor NHL game. Having attended a late-January nighttime 2014 Stadium Series matchup at Yankee Stadium between the New York Rangers and Islanders, where temperatures dropped to 1 degree with the wind chill, I can guarantee the league had fans suffering. I spoke to several of them in the outfield bleachers, huddled under communal blankets, teeth chattering – and claiming they loved every minute of it. Putting them under a roof – even one with open-air sightlines – with temps in the 40s or 50s, isn’t quite the experience these events purport. So, that’s one hockey problem this city might have a tough time overcoming. Sure, there’s time to convince the league of a different direction. After all, they played a 2014 Stadium Series game at Dodger Stadium in Los Angeles between the Kings and Anaheim Ducks in high-70s temperatures that weren’t exactly reminiscent of early Canadian shinny. Then again, outdoor hockey in L.A. was a novelty in itself, owed largely to advanced refrigeration technology. Perhaps they’ll have developed a way to rainproof ice surfaces by the time our city gets around to seriously bidding on an outdoor game. If not, we’ll likely have an NHL expansion draft to look forward to here by June 2021. And the only blankets you’ll need to bring will be for picnicking on the lawn outside KeyArena ahead of time.